Prominent & Leading Manufacturer from Faridabad, we offer poly offset printing machine, poly offset machines, single color poly offset machine, single color poly offset printing machine, two color poly offset printing machine and double color poly offset printing machine. Our organization is counted amongst the most distinguished traders of technologically advanced Poly Offset Printing Machines. All these machines are a great combination of mini offset and UV system that is used for printing various types of polythene bags, non-woven fabric bags/ cut-sheets and paper. Size 15" x 20" 16" x 22"
Power Supply 220 v / 1 Ph. / 50 Hz. 220 v / 1 Ph. / 50 Hz. FAIRPRINT Poly Offset Machine is unique combination of Mini Offset UV System (specially made for drying of UV based surfaces) which can be used for printing various types of Polythene Bags (Punched Un-punched), Non-Woven Fabric Bags/ Cut-sheets and Paper to suit varying needs of the customer. FairPrint Polythene Offset Printing Machines are widely appreciated and recognized for their high quality, reliability, efficiency and economy in India and Worldwide. This provides Best Value for Money to printers who are currently doing the task by Screen, Treadle / Chandler. Also helps to reduce the man power drastically to manage same quantum of work. We are leading manufacturers, suppliers and exporters of Polythene Offset Printing Machines in India. Our product range consists of Polythene Offset Printing presses Polythene Printing Machines (of Single Color 2 Color Satellite) which gives enormous flexibility to print Poly/ Non-Woven Bags Carry Bags of small big sizes as per the requirements. Single Color Poly Offset considers various changing needs for offset printers. Poly Offset is easy to operate having user friendly features and have short changeover time. FAIRPRINT Single Color Poly Offset is unique combination of Mini Offset UV System (specially made for drying of UV based surfaces) which can be used for printing various types of Polythene Bags (Punched Un-punched), Non-Woven Fabric Bags/ Cut-sheets and Paper to suit varying needs of the customer. FairPrint Single Color Poly Offset are widely appreciated and recognized for their high quality, reliability, efficiency and economy in India and Worldwide. This provides Best Value for Money to printers who are currently doing the task by Screen, Treadle / Chandler. Also helps to reduce the man power drastically to manage same quantum of work. We are leading manufacturers, suppliers and exporters of Polythene Offset Printing Machines in India. Our product range consists of Polythene Offset Printing presses Single Color Poly Offset (of Single Color 2 Color Satellite) which gives enormous flexibility to print Poly/ Non-Woven Bags Carry Bags of small big sizes as per the requirements. FAIRPRINT Single Color Poly Offset Printing Machine is unique combination of Mini Offset UV System (specially made for drying of UV based surfaces) which can be used for printing various types of Polythene Bags (Punched Un-punched), Non-Woven Fabric Bags/ Cut-sheets and Paper to suit varying needs of the customer. FairPrint Single Color Poly Offset Printing Machine are widely appreciated and recognized for their high quality, reliability, efficiency and economy in India and Worldwide. This provides Best Value for Money to printers who are currently doing the task by Screen, Treadle / Chandler. Also helps to reduce the man power drastically to manage same quantum of work. We are leading manufacturers, suppliers and exporters of Polythene Offset Printing Machines in India. Our product range consists of Polythene Offset Printing presses Single Color Poly Offset Printing Machine (of Single Color 2 Color Satellite) which gives enormous flexibility to print Poly/ Non-Woven Bags Carry Bags of small big sizes as per the requirements. Single Color Poly Offset Printing Machine considers various changing needs for offset printers. Poly Offset is easy to operate having user friendly features and have short changeover time. FairPrint Two Color Poly Offset Printing Machine Manufacturer in India. Two Color Poly Bag Printing Machine is unique combination of Mini Offset UV System (specially made for drying of UV based surfaces) which can be used for printing various types of Polythene Bags (Punched Un-punched), Non-Woven Fabric Bags/ Cut-sheets and Paper to suit varying needs of the customer. FairPrint Two Color Poly Offset Printing Machine are widely appreciated and recognized for their high quality, reliability, efficiency and economy in India and Worldwide. This provides Best Value for Money to printers who are currently doing the task by Screen, Treadle / Chandler. Also helps to reduce the man power drastically to manage same quantum of work. We are leading manufacturers, suppliers and exporters of Polythene Offset Printing Machines in India. Our product range consists of Polythene Offset Printing presses Polythene Printing Machines (of Single Color 2 Color Satellite) which gives enormous flexibility to print Poly/ Non-Woven Bags Carry Bag Printing Machine of small big sizes as per the requirements. Two Color Poly Offset Printing Machine considers various changing needs for offset printers for doing Cut Color Jobs, thus making the bag more attractive at Low cost. Two Color Satellite Poly Offset is easy to operate having user friendly features and have short changeover time. FairPrint Double Color Poly Offset Printing Machine Manufacturer in India. Double Color Polythene Printing Machine is unique combination of Mini Offset UV System (specially made for drying of UV based surfaces) which can be used for printing various types of Polythene Bags (Punched Un-punched), Non-Woven Fabric Bags/ Cut-sheets and Paper to suit varying needs of the customer. FairPrint Double Color Poly Offset Printing Machine are widely appreciated and recognized for their high quality, reliability, efficiency and economy in India and Worldwide. This provides Best Value for Money to printers who are currently doing the task by Screen, Treadle / Chandler. Also helps to reduce the man power drastically to manage same quantum of work. Double Color Poly Offset Printing Machine considers various changing needs for offset printers for doing Cut Color Jobs, thus making the bag more attractive at Low cost. Two Color Satellite Poly Offset is easy to operate having user friendly features and have short changeover time. FairPrint 2 Color Poly Offset Printing Machine Manufacturer in India. 2 Color Polythene Printing Machine is unique combination of Mini Offset UV System (specially made for drying of UV based surfaces) which can be used for printing various types of Polythene Bags (Punched Un-punched), Non-Woven Fabric Bags/ Cut-sheets and Paper to suit varying needs of the customer. FairPrint 2 Color Poly Offset Printing Machine are widely appreciated and recognized for their high quality, reliability, efficiency and economy in India and Worldwide. This provides Best Value for Money to printers who are currently doing the task by Screen, Treadle / Chandler. Also helps to reduce the man power drastically to manage same quantum of work. 2 Color Poly Offset Printing Machine considers various changing needs for offset printers for doing Cut Color Jobs, thus making the bag more attractive at Low cost. Two Color Satellite Poly Offset is easy to operate having user friendly features and have short changeover time. FairPrint Satellite Poly Offset Manufacturer in India. 2 Color Polythene Printing Machine is unique combination of Mini Offset UV System (specially made for drying of UV based surfaces) which can be used for printing various types of Polythene Bags (Punched Un-punched), Non-Woven Fabric Bags/ Cut-sheets and Paper to suit varying needs of the customer. FairPrint Satellite Poly Offset are widely appreciated and recognized for their high quality, reliability, efficiency and economy in India and Worldwide. This provides Best Value for Money to printers who are currently doing the task by Screen, Treadle / Chandler. Also helps to reduce the man power drastically to manage same quantum of work. Satellite Poly Offset considers various changing needs for offset printers for doing Cut Color Jobs, thus making the bag more attractive at Low cost. Two Color Satellite Poly Offset is easy to operate having user friendly features and have short changeover time. With an aim to stand tall on the expectations of our esteemed clients, we are providing Poly Bag Printing Machine that is used for printing various types of poly bags. Our offered printing machine is manufactured by our talented professionals using optimum quality components and sophisticated technology. The provided printing machine is precisely designed in various models and specifications as per the application requirement of our clients. Customer needs have always been the focus of point for Fair print. These have been the inspiration & driving force for the design and development of futuristic, feature rich machines. Our customer dream it & our highly dedicated engineers design it. This brings the Fair prints Poly Bag Printing Machine which is the perfect solution for high quality Two Color printing on Paper / non-Woven Bags & Fabrics, short and medium run jobs. 2 C Satellite Offset is highly compact as second printing unit is mounted on single color offset just before the 1st printing unit. This consumes less power as well. This Poly Bag Printing Machine is best for printing books, stationary, Tabloid Newspaper, Non-woven Bags & similar applications. This gives good printing quality and easy to run. FAIRPRINT Polythene Printing Machine is unique combination of Mini Offset UV System (specially made for drying of UV based surfaces) which can be used for printing various types of Polythene Bags (Punched Un-punched), Non-Woven Fabric Bags/ Cut-sheets and Paper to suit varying needs of the customer. We are leading manufacturers, suppliers and exporters of Polythene Offset Printing Machines in India. Our product range consists of Polythene Offset Printing presses Polythene Printing Machine (of Single Color 2 Color Satellite) which gives enormous flexibility to print Poly/ Non-Woven Bags Carry Bags of small big sizes as per the requirements. 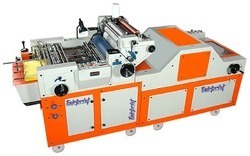 Polythene Printing Machine considers various changing needs for offset printers. Poly Offset is easy to operate having user friendly features and have short changeover time. FAIRPRINT Poly Offset Machine is unique combination of Mini Offset UV System (specially made for drying of UV based surfaces) which can be used for printing various types of Polythene Bags ( Punched Un-punched), Non-Woven Fabric Bags/ Cut-sheets and Paper to suit varying needs of the customer. FairPrint Polythene Offset Printing Machines are widely appreciated and recognized for their high quality, reliability, efficiency and economy in India and Worldwide. This provides Best Value for Money to printers who are currently doing the task by Screen, Treadle / Chandler . Also helps to reduce the man power drastically to manage same quantum of work . FAIRPRINT HM Bag Printing Machine is unique combination of Mini Offset UV System (specially made for drying of UV based surfaces) which can be used for printing various types of Polythene Bags (Punched Un-punched), Non-Woven Fabric Bags/ Cut-sheets and Paper to suit varying needs of the customer. FairPrint HM Bag Printing Machine are widely appreciated and recognized for their high quality, reliability, efficiency and economy in India and Worldwide. This provides Best Value for Money to printers who are currently doing the task by Screen, Treadle / Chandler. Also helps to reduce the man power drastically to manage same quantum of work. We are leading manufacturers, suppliers and exporters of Polythene Offset Printing Machines in India. Our product range consists of Polythene Offset Printing presses HM Bag Printing Machine (of Single Color 2 Color Satellite) which gives enormous flexibility to print Poly/ Non-Woven Bags Carry Bags of small big sizes as per the requirements. HM Bag Printing Machine considers various changing needs for offset printers. Poly Offset is easy to operate having user friendly features and have short changeover time. FAIRPRINT Single Color Poly Bag Printing Machine is unique combination of Mini Offset UV System (specially made for drying of UV based surfaces) which can be used for printing various types of Polythene Bags (Punched Un-punched), Non-Woven Fabric Bags/ Cut-sheets and Paper to suit varying needs of the customer. FairPrint Single Color Poly Bag Printing Machine are widely appreciated and recognized for their high quality, reliability, efficiency and economy in India and Worldwide. This provides Best Value for Money to printers who are currently doing the task by Screen, Treadle / Chandler. Also helps to reduce the man power drastically to manage same quantum of work. We are leading manufacturers, suppliers and exporters of Polythene Offset Printing Machines in India. Our product range consists of Polythene Offset Printing presses Single Color Poly Bag Printing Machine (of Single Color 2 Color Satellite) which gives enormous flexibility to print Poly/ Non-Woven Bags Carry Bags of small big sizes as per the requirements. Single Color Poly Bag Printing Machine considers various changing needs for offset printers. Poly Offset is easy to operate having user friendly features and have short changeover time. FAIRPRINT Single Color Plastic Bag Printing Machine is unique combination of Mini Offset UV System (specially made for drying of UV based surfaces) which can be used for printing various types of Polythene Bags (Punched Un-punched), Non-Woven Fabric Bags/ Cut-sheets and Paper to suit varying needs of the customer. FairPrint Single Color Plastic Bag Printing Machine are widely appreciated and recognized for their high quality, reliability, efficiency and economy in India and Worldwide. This provides Best Value for Money to printers who are currently doing the task by Screen, Treadle / Chandler. Also helps to reduce the man power drastically to manage same quantum of work. We are leading manufacturers, suppliers and exporters of Polythene Offset Printing Machines in India. Our product range consists of Polythene Offset Printing presses Single Color Plastic Bag Printing Machine (of Single Color 2 Color Satellite) which gives enormous flexibility to print Poly/ Non-Woven BagsCarry Bags of small big sizes as per the requirements. Single Color Plastic Bag Printing Machine considers various changing needs for offset printers. Poly Offset is easy to operate having user friendly features and have short changeover time. FAIRPRINT Single Color Polythene Printing Machine is unique combination of Mini Offset UV System (specially made for drying of UV based surfaces) which can be used for printing various types of Polythene Bags (Punched Un-punched), Non-Woven Fabric Bags/ Cut-sheets and Paper to suit varying needs of the customer. FairPrint Single Color Polythene Printing Machine are widely appreciated and recognized for their high quality, reliability, efficiency and economy in India and Worldwide. This provides Best Value for Money to printers who are currently doing the task by Screen, Treadle / Chandler. Also helps to reduce the man power drastically to manage same quantum of work. We are leading manufacturers, suppliers and exporters of Polythene Offset Printing Machines in India. Our product range consists of Polythene Offset Printing presses Single Color Polythene Printing Machine (of Single Color 2 Color Satellite) which gives enormous flexibility to print Poly/ Non-Woven Bags Carry Bags of small big sizes as per the requirements. Single Color Polythene Printing Machine considers various changing needs for offset printers. Poly Offset is easy to operate having user friendly features and have short changeover time. FAIRPRINT Single Color Poly Printing Machine is unique combination of Mini Offset UV System (specially made for drying of UV based surfaces) which can be used for printing various types of Polythene Bags (Punched Un-punched), Non-Woven Fabric Bags/ Cut-sheets and Paper to suit varying needs of the customer. FairPrint Single Color Poly Printing Machine are widely appreciated and recognized for their high quality, reliability, efficiency and economy in India and Worldwide. This provides Best Value for Money to printers who are currently doing the task by Screen, Treadle / Chandler. Also helps to reduce the man power drastically to manage same quantum of work. We are leading manufacturers, suppliers and exporters of Polythene Offset Printing Machines in India. Our product range consists of Polythene Offset Printing presses Single Color Poly Printing Machine (of Single Color 2 Color Satellite) which gives enormous flexibility to print Poly/ Non-Woven Bags Carry Bags of small big sizes as per the requirements. Single Color Poly Printing Machine considers various changing needs for offset printers. Poly Offset is easy to operate having user friendly features and have short changeover time. FAIRPRINT Poly Carry Bag Printing Machine is unique combination of Mini Offset UV System (specially made for drying of UV based surfaces) which can be used for printing various types of Polythene Bags (Punched Un-punched), Non-Woven Fabric Bags/ Cut-sheets and Paper to suit varying needs of the customer. FairPrint Poly Carry Bag Printing Machine are widely appreciated and recognized for their high quality, reliability, efficiency and economy in India and Worldwide. This provides Best Value for Money to printers who are currently doing the task by Screen, Treadle / Chandler. Also helps to reduce the man power drastically to manage same quantum of work. We are leading manufacturers, suppliers and exporters of Polythene Offset Printing Machines in India. Our product range consists of Polythene Offset Printing presses Poly Carry Bag Printing Machine (of Single Color 2 Color Satellite) which gives enormous flexibility to print Poly/ Non-Woven Bags Carry Bags of small big sizes as per the requirements. Poly Carry Bag Printing Machine considers various changing needs for offset printers. Poly Offset is easy to operate having user friendly features and have short changeover time. 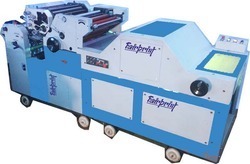 FAIRPRINT Poly Printing Machine is unique combination of Mini Offset UV System (specially made for drying of UV based surfaces) which can be used for printing various types of Polythene Bags (Punched Un-punched), Non-Woven Fabric Bags/ Cut-sheets and Paper to suit varying needs of the customer. FairPrint Poly Printing Machine are widely appreciated and recognized for their high quality, reliability, efficiency and economy in India and Worldwide. This provides Best Value for Money to printers who are currently doing the task by Screen, Treadle / Chandler. Also helps to reduce the man power drastically to manage same quantum of work. We are leading manufacturers, suppliers and exporters of Polythene Offset Printing Machines in India. Our product range consists of Polythene Offset Printing presses Poly Printing Machine (of Single Color 2 Color Satellite) which gives enormous flexibility to print Poly/ Non-Woven Bags Carry Bags of small big sizes as per the requirements. Poly Printing Machine considers various changing needs for offset printers. Poly Offset is easy to operate having user friendly features and have short changeover time. FairPrint Poly Offset Carry bag printing machines Manufacturer in India.Two Color Poly Offset Machine is unique combination of Mini Offset UV System (specially made for drying of UV based surfaces) which can be used for printing various types of Polythene Bags (Punched Un-punched), Non-Woven Fabric Bags/ Cut-sheets and Paper to suit varying needs of the customer. Two Color Satellite Poly Offset considers various changing needs for offset printers for doing Cut Color Jobs, thus making the bag more attractive at Low cost. Two Color Satellite Poly Offset is easy to operate having user friendly features and have short changeover time. FairPrint Two Color Poly Bag Printing Machine Manufacturer in India. Two Color Poly Bag Printing Machine is unique combination of Mini Offset UV System (specially made for drying of UV based surfaces) which can be used for printing various types of Polythene Bags (Punched Un-punched), Non-Woven Fabric Bags/ Cut-sheets and Paper to suit varying needs of the customer. FairPrint Two Color Poly Bag Printing Machine are widely appreciated and recognized for their high quality, reliability, efficiency and economy in India and Worldwide. This provides Best Value for Money to printers who are currently doing the task by Screen, Treadle / Chandler. Also helps to reduce the man power drastically to manage same quantum of work. Two Color Poly Bag Printing Machine considers various changing needs for offset printers for doing Cut Color Jobs, thus making the bag more attractive at Low cost. Two Color Satellite Poly Offset is easy to operate having user friendly features and have short changeover time. FairPrint Two Color Plastic Bag Printing Machine Manufacturer in India. Two Color Plastic Bag Printing Machine is unique combination of Mini Offset UV System (specially made for drying of UV based surfaces) which can be used for printing various types of Polythene Bags (Punched Un-punched), Non-Woven Fabric Bags/ Cut-sheets and Paper to suit varying needs of the customer. FairPrint Two Color Plastic Bag Printing Machine are widely appreciated and recognized for their high quality, reliability, efficiency and economy in India and Worldwide. This provides Best Value for Money to printers who are currently doing the task by Screen, Treadle / Chandler. Also helps to reduce the man power drastically to manage same quantum of work. Two Color Plastic Bag Printing Machine considers various changing needs for offset printers for doing Cut Color Jobs, thus making the bag more attractive at Low cost. Two Color Satellite Poly Offset is easy to operate having user friendly features and have short changeover time. FairPrint Two Color Polyuthene Printing Machine Manufacturer in India. Two Color Plastic Bag Printing Machine is unique combination of Mini Offset UV System (specially made for drying of UV based surfaces) which can be used for printing various types of Polythene Bags (Punched Un-punched), Non-Woven Fabric Bags/ Cut-sheets and Paper to suit varying needs of the customer. FairPrint Two Color Polythene Printing Machine are widely appreciated and recognized for their high quality, reliability, efficiency and economy in India and Worldwide. This provides Best Value for Money to printers who are currently doing the task by Screen, Treadle / Chandler. Also helps to reduce the man power drastically to manage same quantum of work. Two Color Polythene Printing Machine considers various changing needs for offset printers for doing Cut Color Jobs, thus making the bag more attractive at Low cost. Two Color Satellite Poly Offset is easy to operate having user friendly features and have short changeover time. FairPrint Two Color Poly Printing Machine Manufacturer in India. Two Color Poly Printing Machine is unique combination of Mini Offset UV System (specially made for drying of UV based surfaces) which can be used for printing various types of Polythene Bags (Punched Un-punched), Non-Woven Fabric Bags/ Cut-sheets and Paper to suit varying needs of the customer. FairPrint Two Color Poly Printing Machine are widely appreciated and recognized for their high quality, reliability, efficiency and economy in India and Worldwide. This provides Best Value for Money to printers who are currently doing the task by Screen, Treadle / Chandler. Also helps to reduce the man power drastically to manage same quantum of work. Two Color Poly Printing Machine considers various changing needs for offset printers for doing Cut Color Jobs, thus making the bag more attractive at Low cost. Two Color Satellite Poly Offset is easy to operate having user friendly features and have short changeover time. 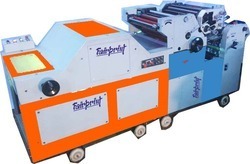 FairPrint Double Color Poly Printing Machine Manufacturer in India. Double Color Poly Printing Machine is unique combination of Mini Offset UV System (specially made for drying of UV based surfaces) which can be used for printing various types of Polythene Bags (Punched Un-punched), Non-Woven Fabric Bags/ Cut-sheets and Paper to suit varying needs of the customer. FairPrint Double Color Poly Printing Machine are widely appreciated and recognized for their high quality, reliability, efficiency and economy in India and Worldwide. This provides Best Value for Money to printers who are currently doing the task by Screen, Treadle / Chandler. Also helps to reduce the man power drastically to manage same quantum of work. Double Color Poly Printing Machine considers various changing needs for offset printers for doing Cut Color Jobs, thus making the bag more attractive at Low cost. Two Color Satellite Poly Offset is easy to operate having user friendly features and have short changeover time. FairPrint Double Color Polythene Printing Machine Manufacturer in India. Double Color Polythene Printing Machine is unique combination of Mini Offset UV System (specially made for drying of UV based surfaces) which can be used for printing various types of Polythene Bags (Punched Un-punched), Non-Woven Fabric Bags/ Cut-sheets and Paper to suit varying needs of the customer. FairPrint Double Color Polythene Printing Machine are widely appreciated and recognized for their high quality, reliability, efficiency and economy in India and Worldwide. This provides Best Value for Money to printers who are currently doing the task by Screen, Treadle / Chandler. Also helps to reduce the man power drastically to manage same quantum of work. Double Color Polythene Printing Machine considers various changing needs for offset printers for doing Cut Color Jobs, thus making the bag more attractive at Low cost. Two Color Satellite Poly Offset is easy to operate having user friendly features and have short changeover time. FairPrint Double Color Plastic Bag Printing Machine Manufacturer in India. Double Color Polythene Printing Machine is unique combination of Mini Offset UV System (specially made for drying of UV based surfaces) which can be used for printing various types of Polythene Bags (Punched Un-punched), Non-Woven Fabric Bags/ Cut-sheets and Paper to suit varying needs of the customer. FairPrint Double Color Plastic Bag Printing Machine are widely appreciated and recognized for their high quality, reliability, efficiency and economy in India and Worldwide. This provides Best Value for Money to printers who are currently doing the task by Screen, Treadle / Chandler. Also helps to reduce the man power drastically to manage same quantum of work. Double Color Plastic Bag Printing Machine considers various changing needs for offset printers for doing Cut Color Jobs, thus making the bag more attractive at Low cost. Two Color Satellite Poly Offset is easy to operate having user friendly features and have short changeover time. FairPrint Double Color Poly Bag Printing Machine Manufacturer in India. Double Color Polythene Printing Machine is unique combination of Mini Offset UV System (specially made for drying of UV based surfaces) which can be used for printing various types of Polythene Bags (Punched Un-punched), Non-Woven Fabric Bags/ Cut-sheets and Paper to suit varying needs of the customer. FairPrint Double Color Poly Bag Printing Machine are widely appreciated and recognized for their high quality, reliability, efficiency and economy in India and Worldwide. This provides Best Value for Money to printers who are currently doing the task by Screen, Treadle / Chandler. Also helps to reduce the man power drastically to manage same quantum of work. Double Color Poly Bag Printing Machine considers various changing needs for offset printers for doing Cut Color Jobs, thus making the bag more attractive at Low cost. Two Color Satellite Poly Offset is easy to operate having user friendly features and have short changeover time. FairPrint Double Color Poly Offset Manufacturer in India. Double Color Polythene Printing Machine is unique combination of Mini Offset UV System (specially made for drying of UV based surfaces) which can be used for printing various types of Polythene Bags (Punched Un-punched), Non-Woven Fabric Bags/ Cut-sheets and Paper to suit varying needs of the customer. FairPrint Double Color Poly Offset are widely appreciated and recognized for their high quality, reliability, efficiency and economy in India and Worldwide. This provides Best Value for Money to printers who are currently doing the task by Screen, Treadle / Chandler. Also helps to reduce the man power drastically to manage same quantum of work. Double Color Poly Offset considers various changing needs for offset printers for doing Cut Color Jobs, thus making the bag more attractive at Low cost. Two Color Satellite Poly Offset is easy to operate having user friendly features and have short changeover time. FairPrint 2 Color Poly Offset Manufacturer in India. 2 Color Polythene Printing Machine is unique combination of Mini Offset UV System (specially made for drying of UV based surfaces) which can be used for printing various types of Polythene Bags (Punched Un-punched), Non-Woven Fabric Bags/ Cut-sheets and Paper to suit varying needs of the customer. FairPrint 2 Color Poly Offset are widely appreciated and recognized for their high quality, reliability, efficiency and economy in India and Worldwide. This provides Best Value for Money to printers who are currently doing the task by Screen, Treadle / Chandler. Also helps to reduce the man power drastically to manage same quantum of work. 2 Color Poly Offset considers various changing needs for offset printers for doing Cut Color Jobs, thus making the bag more attractive at Low cost. Two Color Satellite Poly Offset is easy to operate having user friendly features and have short changeover time. FairPrint 2 Color Poly Bag Printing Machine Manufacturer in India. 2 Color Polythene Printing Machine is unique combination of Mini Offset UV System (specially made for drying of UV based surfaces) which can be used for printing various types of Polythene Bags (Punched Un-punched), Non-Woven Fabric Bags/ Cut-sheets and Paper to suit varying needs of the customer. FairPrint 2 Color Poly Bag Printing Machine are widely appreciated and recognized for their high quality, reliability, efficiency and economy in India and Worldwide. This provides Best Value for Money to printers who are currently doing the task by Screen, Treadle / Chandler. Also helps to reduce the man power drastically to manage same quantum of work. 2 Color Poly Bag Printing Machine considers various changing needs for offset printers for doing Cut Color Jobs, thus making the bag more attractive at Low cost. Two Color Satellite Poly Offset is easy to operate having user friendly features and have short changeover time. FairPrint 2 Color Plastic Bag Printing Machine Manufacturer in India. 2 Color Polythene Printing Machine is unique combination of Mini Offset UV System (specially made for drying of UV based surfaces) which can be used for printing various types of Polythene Bags (Punched Un-punched), Non-Woven Fabric Bags/ Cut-sheets and Paper to suit varying needs of the customer. FairPrint 2 Color Poly Plastic Bag Printing Machine are widely appreciated and recognized for their high quality, reliability, efficiency and economy in India and Worldwide. This provides Best Value for Money to printers who are currently doing the task by Screen, Treadle / Chandler. Also helps to reduce the man power drastically to manage same quantum of work. 2 Color Poly Plastic Bag Printing Machine considers various changing needs for offset printers for doing Cut Color Jobs, thus making the bag more attractive at Low cost. Two Color Satellite Poly Offset is easy to operate having user friendly features and have short changeover time. FairPrint 2 Color Polythene Printing Machine Manufacturer in India. 2 Color Polythene Printing Machine is unique combination of Mini Offset UV System (specially made for drying of UV based surfaces) which can be used for printing various types of Polythene Bags (Punched Un-punched), Non-Woven Fabric Bags/ Cut-sheets and Paper to suit varying needs of the customer. FairPrint 2 Color Poly Polythene Printing Machine are widely appreciated and recognized for their high quality, reliability, efficiency and economy in India and Worldwide. This provides Best Value for Money to printers who are currently doing the task by Screen, Treadle / Chandler. Also helps to reduce the man power drastically to manage same quantum of work. 2 Color Poly Polythene Printing Machine considers various changing needs for offset printers for doing Cut Color Jobs, thus making the bag more attractive at Low cost. Two Color Satellite Poly Offset is easy to operate having user friendly features and have short changeover time. FairPrint 2 Color Poly Printing Machine Manufacturer in India. 2 Color Polythene Printing Machine is unique combination of Mini Offset UV System (specially made for drying of UV based surfaces) which can be used for printing various types of Polythene Bags (Punched Un-punched), Non-Woven Fabric Bags/ Cut-sheets and Paper to suit varying needs of the customer. FairPrint 2 Color Poly Poly Printing Machine are widely appreciated and recognized for their high quality, reliability, efficiency and economy in India and Worldwide. This provides Best Value for Money to printers who are currently doing the task by Screen, Treadle / Chandler. Also helps to reduce the man power drastically to manage same quantum of work. 2 Color Poly Poly Printing Machine considers various changing needs for offset printers for doing Cut Color Jobs, thus making the bag more attractive at Low cost. Two Color Satellite Poly Offset is easy to operate having user friendly features and have short changeover time. FairPrint Two Color Satellite Poly Offset Manufacturer in India. 2 Color Polythene Printing Machine is unique combination of Mini Offset UV System (specially made for drying of UV based surfaces) which can be used for printing various types of Polythene Bags (Punched Un-punched), Non-Woven Fabric Bags/ Cut-sheets and Paper to suit varying needs of the customer. FairPrint Two Color Satellite Poly Offset are widely appreciated and recognized for their high quality, reliability, efficiency and economy in India and Worldwide. This provides Best Value for Money to printers who are currently doing the task by Screen, Treadle / Chandler. Also helps to reduce the man power drastically to manage same quantum of work. FairPrint Two Color Satellite Printing Machine Manufacturer in India. 2 Color Polythene Printing Machine is unique combination of Mini Offset UV System (specially made for drying of UV based surfaces) which can be used for printing various types of Polythene Bags (Punched Un-punched), Non-Woven Fabric Bags/ Cut-sheets and Paper to suit varying needs of the customer. FairPrint Two Color Satellite Printing Machine are widely appreciated and recognized for their high quality, reliability, efficiency and economy in India and Worldwide. This provides Best Value for Money to printers who are currently doing the task by Screen, Treadle / Chandler. Also helps to reduce the man power drastically to manage same quantum of work. Two Color Satellite Printing Machine considers various changing needs for offset printers for doing Cut Color Jobs, thus making the bag more attractive at Low cost. Two Color Satellite Poly Offset is easy to operate having user friendly features and have short changeover time. FairPrint Double Color Satellite Printing Machine Manufacturer in India. 2 Color Polythene Printing Machine is unique combination of Mini Offset UV System (specially made for drying of UV based surfaces) which can be used for printing various types of Polythene Bags (Punched Un-punched), Non-Woven Fabric Bags/ Cut-sheets and Paper to suit varying needs of the customer. FairPrint Double Color Satellite Printing Machine are widely appreciated and recognized for their high quality, reliability, efficiency and economy in India and Worldwide. This provides Best Value for Money to printers who are currently doing the task by Screen, Treadle / Chandler. Also helps to reduce the man power drastically to manage same quantum of work. Double Color Satellite Printing Machine considers various changing needs for offset printers for doing Cut Color Jobs, thus making the bag more attractive at Low cost. Two Color Satellite Poly Offset is easy to operate having user friendly features and have short changeover time. FairPrint Double Color Satellite Poly Offset Manufacturer in India. 2 Color Polythene Printing Machine is unique combination of Mini Offset UV System (specially made for drying of UV based surfaces) which can be used for printing various types of Polythene Bags (Punched Un-punched), Non-Woven Fabric Bags/ Cut-sheets and Paper to suit varying needs of the customer. FairPrint Double Color Satellite Poly Offset are widely appreciated and recognized for their high quality, reliability, efficiency and economy in India and Worldwide. This provides Best Value for Money to printers who are currently doing the task by Screen, Treadle / Chandler. Also helps to reduce the man power drastically to manage same quantum of work. Double Color Satellite Poly Offset considers various changing needs for offset printers for doing Cut Color Jobs, thus making the bag more attractive at Low cost. Two Color Satellite Poly Offset is easy to operate having user friendly features and have short changeover time. FairPrint 2 Color Satellite Poly Offset Manufacturer in India. 2 Color Polythene Printing Machine is unique combination of Mini Offset UV System (specially made for drying of UV based surfaces) which can be used for printing various types of Polythene Bags (Punched Un-punched), Non-Woven Fabric Bags/ Cut-sheets and Paper to suit varying needs of the customer. FairPrint 2 Color Satellite Poly Offset are widely appreciated and recognized for their high quality, reliability, efficiency and economy in India and Worldwide. This provides Best Value for Money to printers who are currently doing the task by Screen, Treadle / Chandler. Also helps to reduce the man power drastically to manage same quantum of work. 2 Color Satellite Poly Offset considers various changing needs for offset printers for doing Cut Color Jobs, thus making the bag more attractive at Low cost. Two Color Satellite Poly Offset is easy to operate having user friendly features and have short changeover time. FairPrint 2 Color Satellite Poly Printing Machine Manufacturer in India. 2 Color Polythene Printing Machine is unique combination of Mini Offset UV System (specially made for drying of UV based surfaces) which can be used for printing various types of Polythene Bags (Punched Un-punched), Non-Woven Fabric Bags/ Cut-sheets and Paper to suit varying needs of the customer. FairPrint 2 Color Satellite Poly Printing Machine are widely appreciated and recognized for their high quality, reliability, efficiency and economy in India and Worldwide. This provides Best Value for Money to printers who are currently doing the task by Screen, Treadle / Chandler. Also helps to reduce the man power drastically to manage same quantum of work. 2 Color Satellite Poly Printing Machine considers various changing needs for offset printers for doing Cut Color Jobs, thus making the bag more attractive at Low cost. Two Color Satellite Poly Offset is easy to operate having user friendly features and have short changeover time.